As you may have seen from a post we put out a month ago, we have something of epic, world-changing proportions coming up. It’s FINALLY here. Orange Is The New Black is back. Season 3 hits our Netflix on June 12th and instead of sitting in bed and watching it by ourselves we came up with a better plan. 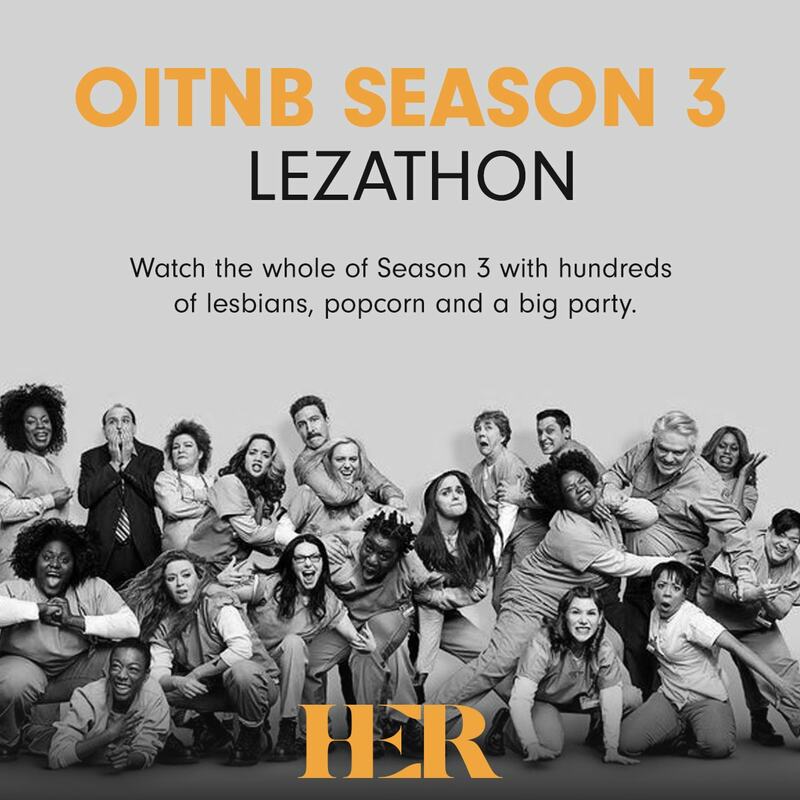 We are running 5 Orange Is The New Black Lesbian Marathons ( a.k.a. Lezathons) across the world. If you are in: Chicago, LA, London, NYC or San Francisco – you’re second weekend in June is about to get a whole lot better. In each city we are bringing together between 60 and 250 girls to hang out, watch as much OITNB as they can handle (or our venue permits), drink tequila and enjoy a massive lez style party. All whilst supporting a local LGBT charity in your area. Tickets are on sale now and all profits will be donated to an amazing organisation from your city, to support the work they do for your LGBT community. And if that doesn’t sound good enough, we’re partnering with a local party or Pride event to get you discount tickets to an after party. Think you’re about to explode with excitement? Just wait until you’re there on the day. PLUS! Hit attending to the event in the app to win tonnes of prizes on the day, like HER tanks, drinks and POPCORN. Wait, what happened to the Boston one? The team will will be in SF so we will see you there there! Wish there was an event in Tulsa! !